Greece has so much more to offer than island hopping and white sand beaches. So skip the beach - and the crowds - and head directly inland to discover history, vineyards, and Greek culture. Meet Dobby the stray dog. A true underdog. She's mangy, a little unloved, and recently had puppies, who I think were somewhere within the sprawling Greek hills. So true to Michael's nature, this scruffy fur ball pulled his heart strings, and we gained a temporary pet. She began to walk within two feet behind us, but then Dobby veered too closely to traffic one too many times for Michael's taste. So the slapdash bandana-leash kept his nerves at ease. However, this mommy-dog was a free spirit, you see, and she wasn't about to be tied down by anybody, including well intentioned travelers. She fought, gnawed, and was finally freed of her leash. And this time we tailed her, almost back to town. Yet just as we reached the trailhead, Dobby stopped in her tracks, and didn't budge one more step. I think she was off to tend to her puppies, just as we were off to bed to tend to our bellies. Feta And Olives And Wine! Oh My! I knew Greeks were passionate about food. However, I realized the extent of their love when I watched a little old ya-ya spoon feed Michael soup. And I think they have a leg to stand on. This was my Charlie and the Chocolate Factory moment. After the yaya encounter, I tried every single Greek dish that I could possibly get my hands on. Imam, moussaka, Corinthian white wine, lamb, mastic ice cream, all-the-baklava, koulouri, dolmas, you name it. But my very favorite (and even before Greece) is grilled octopus. If I could eat this every day, I wouldn't hesitate. My advice to Greece bound travelers: try it all. You won't be disappointed. Athens, and all of Greece, has done a phenomenal job of preserving their archeological sites. 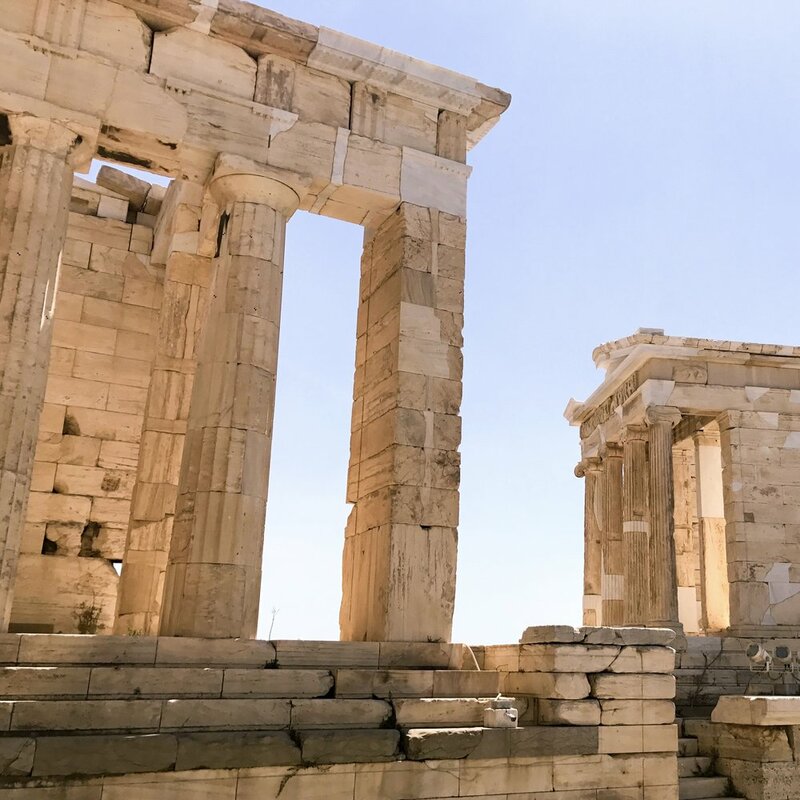 If you have time before jetting out to the islands, spend a day visiting the Acropolis Museum – it’s only a $5 entry fee – and meandering your way up to the Acropolis itself. Once at the top, it offers a stunning view of Athens. Also, it’s incredible to stroll along the paths where ancient Greeks once looked down upon their city. If you’re not too tired from the museum and the Acropolis, steal away at the Hill of the Muses. It offers just a little more seclusion from the typical tourist crowds. I love history, and I’m motivated to travel by the people and their culture. So I skipped the beaches and went inland to learn more about Greek history. I made day trips from Athens to Meteora, Delphi, and Mycenae. However, Meteora was by far my favorite. This collection of 6 monasteries, located at the tippy-top of sandstone cliffs. The communities were built stone-by-stone at the hands of rock climbing monks. And sadly my photos don’t do the staggering height justice. However, while standing directly under these rock pillars, I could barely crane my neck high enough to see the top. My knees go weak even thinking about climbing these monoliths solo.